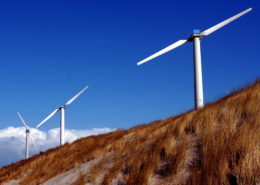 Over the last decade wind turbines and wind parks have taken off in spectacular fashion. Things are changing. Producing energy where you need it makes more sense than transporting it over long distances and using wind turbines to do this is known as distributed wind power. In recent years, many governments around the globe have developed special, multiple level feed-in tariff structures for wind turbines. The tariffs and conditions for midsize wind turbines often make these an attractive proposition for farmers, local businesses and communities. Though the feed-in tariffs and conditions differ from country to country, more governments are expected to follow this strategy in the years ahead. It is the goal of Wind Energy Solutions to remain the global market leader in the growing market for midsize wind turbines. To achieve this, Wind Energy Solutions will continue to develop specific technology based on its WES50, WES80, WES100, and WES250 wind turbines. Developments and refinements can be made to suit specific grids, markets and/or regions. Our partnerships with our dealer channel are key to establishing WES, and wind-power itself, in specific markets and/or regions. Now having the necessary experience and knowledge, WES is simultaneously focusing on high volume projects, as well as targeting international project developers, financial institutions, investors and governmental organizations around the world. We also have a specific focus to further develop our solutions for isolated grids that use diesel to generate electricity. These grids can be found on islands, in mountains and on other remote places around the world. It is our ambition to use our unique frequency-controlled management system to solve complex energy issues in isolated grids of up to 4 megawatt. In the future Wind Energy Solutions will manufacture more types of turbine meeting the needs of midsize turbine markets worldwide. 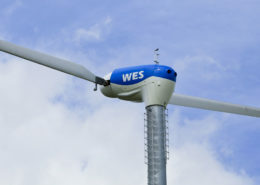 The original design of the successful WES wind turbine was produced by the Dutch wind turbine pioneer, Henk Lagerwey, as far back as the early 1980s. However, in 2003, Lagerwey went out of business due to changes in Dutch grants regulations. In 2004 Wind Energy Solution (WES) bought Lagerwey’s exclusive rights, drawings and engineering files in order to give this unique turbine a second life cycle in specific niche markets. Where the original Lagerwey LW wind turbine was installed mainly for farmers in the Netherlands, WES replaced the control system and power conversion with modern, remote-monitored technology and continued to develop, support and sell this successful wind turbine on all five continents under the name WES. The turbine’s typical two-bladed rotor has a unique hinged system and a passive blade angle adjustment. This unique, robust mechanism guarantees a high efficiency and requires only simple and minimal maintenance. 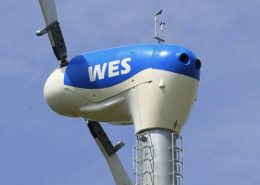 The WES wind turbine has proven itself a durable, reliable high-performance solution. The first turbines have been operational since 1983, are still going strong and continue to generate energy for their owners. 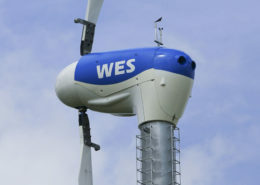 Since the familiar box shaped blue nacelle of the WES turbine was designed in the early 1980s, over 1000 units of the turbine have been installed around the world in agricultural locations, universities, on islands, in small communities and at coastal and mountainous sites.